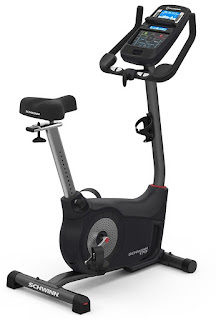 The 2017 Schwinn 170 MY17 Upright Exercise Bike retains all the high-end features of its predecessor, the Schwinn 170 2013, but with a newly designed console that’s more intuitive to use and now comes with the addition of Bluetooth connectivity for seamless transition of workout data to supported smart devices for online goal tracking. The 2017 Schwinn 170 Upright Bike features a high-speed high-inertia perimeter-weighted flywheel together with ECB (Eddy Current Brake) electronic computer controlled magnetic resistance which combine to give smooth and consistent momentum throughout the resistance range. This exercise bike offers 25 levels of ECB resistance to keep you progressively challenged and 29 programs to keep your workouts varied including profile, heart-rate, custom and fitness test programs. The 2017 Schwinn 170 MY17 Upright Exercise Bike’s new easy-to-use console features dual-track blue-backlit LCD screens (3”x5” and 1”x5”) and displays motivating workout stats including time, speed, distance, calories, heart-rate, intensity, goal achievement and % complete. Your heart rate is measured via the built-in pulse grip sensors in the handlebars or alternatively you can use your own wireless heart-rate chest-strap with the telemetry enabled console. 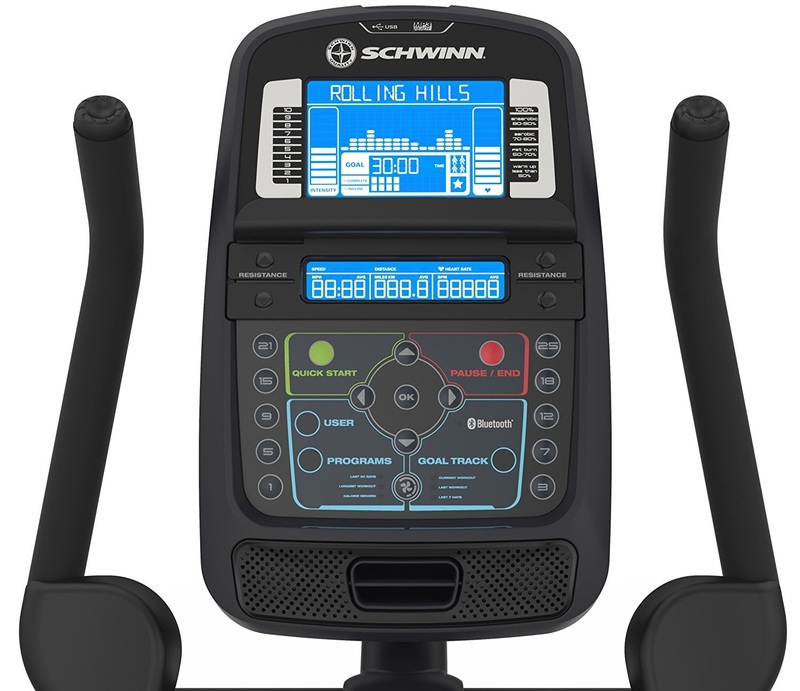 The 2017 Schwinn 170 Upright Bike offers goal tracking and 4 user profiles so 4 different users can use the bike on a regular basis and keep track of their workout stats. The addition of Bluetooth connectivity allows for easy transfer of data to online fitness tracking programs. 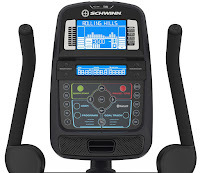 In addition, the 2017 Schwinn 170’s console offers all the high-end features we’ve come to love from Schwinn exercise bikes including USB charging port, acoustic chambered speakers, media shelf and 3-speed cooling fan. The 2017 Schwinn 170 Upright Exercise Bike is ergonomically designed for user comfort. It features a padded contoured seat that is adjustable both up/down and fore/aft for a custom fit. The handlebars are also angle-adjustable and feature elbow rests for maximum comfort. The 2017 Schwinn 170 Upright Bike features a 3-piece crank and oversized pedals with adjustable safety straps for smooth pedaling. The 2017 Schwinn 170 MY17 is sturdily built with integrated levelers for extra stability and allows for a maximum user weight capacity of up to 300 lbs. It also features front-mounted transport wheels for easy relocation. The 2017 Schwinn 170 MY17 Upright Exercise Bike has plenty to offer both beginners and advanced cyclists looking to get fit in the comfort of their own home. You can start off at your own pace and there’s plenty of variety in programs and resistance levels to keep you challenged and motivated. It operates very smoothly and quietly so you can watch TV or listen to music as you exercise and the time will fly by! The bike itself is solidly built and offers comfortable ergonomics and great adjustability for a custom fit for different users. All the extra high-end features on this exercise bike make it a steal at this relatively low price point! Exercise bikes in general offer an effective low-impact workout that’s kinder to your joints compared to many other types of exercise and are one of the easiest forms of exercises to stick with in the long-term to reach your fitness goals.